I’m starting to get the feeling the scorn and ridicule heaped upon Dr. Hussman by the Wall Street shysters is about to be thrown back in their faces. Of course, he isn’t an I told you so type of person. He’s an analytical investor who bases his thinking upon historical facts and valuation methods that have proven accurate over the last 100 years of investing. His two key principles on investing are flashing red. Corporate revenues and profits are falling. The attitude of investors regarding risk is shifting from greed to fear. With valuations at record highs, margin debt at epic levels, and professional investors extremely bullish, even the hint of fear will begin the collapse. It’s already happened twice in the last fifteen years and Hussman called the previous two collapses too. 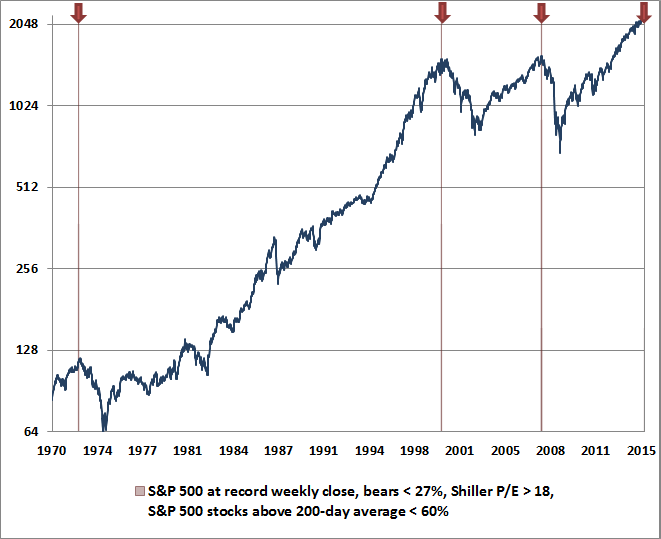 1) Valuations control long-term returns. The higher the price you pay today for each dollar you expect to receive in the future, the lower the long-term return you should expect from your investment. Don’t take current earnings at face value, because profit margins are not permanent. Historically, the most reliable indicators of market valuation are driven by revenues, not earnings. I should make the point that these principles aren’t new. They capture the same principles I laid out in October 2000, at the beginning of a market collapse that would take the S&P 500 down by half and the Nasdaq 100 down by 83%. They capture the same principles that prompted me to turn constructive in April 2003 after that collapse. They capture the same principles I laid out in July 2007, just before the global financial crisis took the S&P 500 down by 55%. For those who are visually astute, please peruse the chart below. The conclusion is quite simple. When the current conditions have existed over the last 45 years, the stock market crashes. Period. 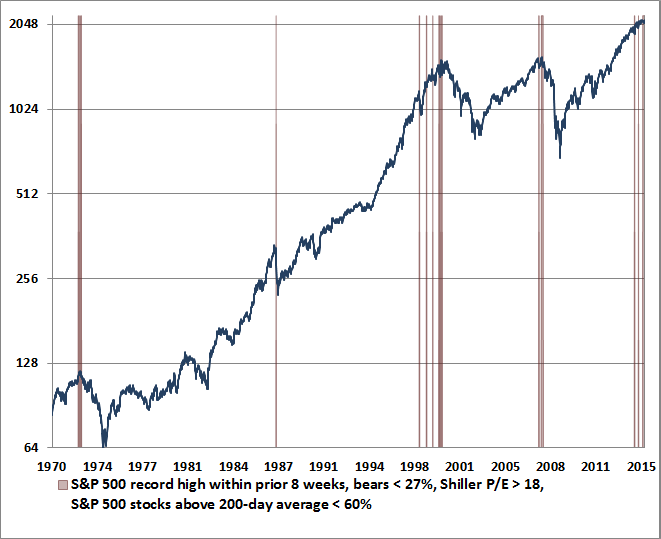 The chart below imposes one additional condition, showing periods where fewer than 60% of S&P 500 stocks were above their respective 200-day moving averages. This is as clear and simple as the Iron Laws can get. The worst market outcomes in history have always emerged after an overvalued, overbought, overbullish advance has been joined by deterioration in market internals. Let’s go one step further, and restrict these instances to weeks where the S&P 500 had just set a record weekly closing high. That restriction kicks out 1987. In that instance, the earliest warnings were from weakness in utilities and corporate bonds, but the percentage of stocks above their own 200-day averages didn’t fall below 60% until the market itself was already down nearly 10% from its high; less than two weeks before the crash. Many trend-followers were caught off-guard because the warning period was so brief. If one wasn’t following a broad range of market internals, one needed to respond almost immediately to the emerging weakness in order to avoid the collapse. The market has fallen for five consecutive days. The Chinese market is already crashing. I wonder how many people are prepared to see their investment portfolio or 401k fall by 50% – again. We’re gonna find out. They do ring a bell at the top. The bell is ringing loud and clear. The bell is ringing so hard, it broke. Anyone not heeding the warnings of Dr. Hussman will end up being much poorer. This will not end well. It’s often said that they don’t ring a bell at the top, and that’s true in many cycles. But it’s interesting that the same “ding” has been heard at the most extreme peaks among them. Look at the data, and you’ll realize that our present concerns are not hyperbole or exaggeration. We simply have not observed the market conditions we observe today except in a handful of instances in market history, and they have typically ended quite badly (see When You Look Back on This Moment in History and All Their Eggs in Janet’s Basket for a more extended discussion of current conditions). In my view, this is one of the most important moments in a generation to examine all of your risk exposures, the extent to which you believe historical evidence is informative, your tolerance for loss, your comfort or discomfort with missing out on potential rallies even in a wickedly overvalued market, and your true investment horizon. It’s perfectly fine to decide, after that consideration, to maintain a bullish outlook. Earnest people can disagree, and that’s what makes markets. But do review all of your risk exposures here.